when the flag drops, the bull…. Stops!!!!!!!! MY GENIE received a lot of help from these three experienced powerboat fans. At left is Mrs. S. Jones, whose husband is owner of Stampede and defender of the Griffith Cup. Helping her are Mrs. R. Jenkin and Mrs. N. Kaye. The speedboat classic will be held at Lake Eppalock tomorrow. A crack field was trampled by The “Glenmaggie Monster” at Lake Eppalock in the most exciting Cup on record which captured 16,000 paying customers! IN A MEETING that beggars superlatives, the best boats from three Australian States and from New Zealand lined up to contest the Cup that has been the top trophy for speedboats for 60 years. With good pre-race publicity and fine weather a crowd of 16,000 paid their dollar and filled the Derrinal Pool amphitheatre. Food stands and drink bars did a roaring trade as the crowd settled to watch a top supporting program. Attracting great interest in the support program was the new stock hydro Frantic Too driven by Ron Haylock. This little Ford powered screamer is the lead boat of a class of one design hydros which will use stock Ford mills and have identical hulls. The scheme, started in Victoria, provides for a fully finished boat to be afloat and racing for under $1000. Late in the afternoon the big ones finished their warm ups and the first elimination heat was started. Crack Kiwi boat Air New Zealand driven by the Mcgregor brothers of Auckland had put in the fastest time in trials the day before and much was expected of this immaculate hydro. With two other Kiwi boats ready for battle, the classic race was shaping up as one for the record books. Entries in heat one of the eliminations were Voodoo IV representing the New Brighton Speedboat Club of New Zealand and driven by Bill Stokes, Canberra SK Yogi Bear driven by the Pearson brothers, Aggressor, Australia’s biggest hydro driven by Dave Tenny and Les Scott, Ern Nunn’s new Wasp Two driven by Des Radburn of Sydney, Black Knight driven by Pat Hawthorn, South Australia’s Villain with Murray Langford, Jo Blo with Jack Bullen in the box seat and Tom Watts’ rugged-looking Exciter driven from a forward position. Aggressor suffered fuelling troubles at flag drop and the “Jolly Green Giant” was left ploughing along as the field blasted off. Watts, pouring on the pressure took Exciter to the lead from Radburn in Wasp Two. Radburn handling the new big Wasp gingerly was still feeling his way and content to let Watts take the running. Yogi Bear with the new 427 ci Chev running easily was sitting on the Wasp’s tail while Jack Bullen played it cagey in Jo Blo. Fuelling troubles over, Tenny began pouring on the coal in the mighty Aggressor. The big boat was blasting down the back straights and sliding around the corners in a curtain of spray. As she passed the tower each lap she was one boat further up. Langford in Villain was having his own private battle with Bill Stoke’s Voodoo but the Kiwi boat was more than 1500 rpm down on her practice time and wasn’t going too well. Aggressor passed the screaming Wasp Two in lap four and moved to second place as Exciter broke down. Out in front, Tenny kept the pressure on to take the heat with a time that was the fastest for both heats. Wasp Two took second place while Yogi Bear, scenting a place, took a flat chat run for the line only to have the shaft coupling let go, sliding the prop into the rudder and barrel rolling the boat. Neither of the shaken crew was injured and prompt rescue soon had the equipe ashore and being worked on. Jo Blo took third place to qualify for the final while Villain and Voodoo both made it with touch and go timing. Frantic efforts in the pits area to clear the throng were futile and as people wandered past madly spinning props and moved back from blazing exhausts, officials yelled themselves hoarse trying to get some sense into the crowd. One unfortunate dog ran right into a fast-spinning prop. Heat two of the eliminations saw the defender taken on to the milling area by Bobby Saniga with Debbie Too from Victoria driven by Glyn Graham, Mystic Miss driven by Tom Watts, Vulture —John Lewis, Chevvy — Len Harris, Slipray — Em Baynton, Redline —Peter Wade, Cheeta — Les Ramsay, and Air New Zealand — John McGregor. Stampede leapt to the lead from the word GO! Trailing a 200 yard tail she swept past Air New Zealand, sidelined with a broken rod and led the field into the turn. Trevor Matthews, driving Assassin, stayed close to the thundering giant with Redline sitting close behind. Watts in the Miss seemed to be losing power and after a quick start was slipping back as the leaders took off. Cheeta, running well, led Vulture into the turns while Chevvie seemed content to keep her place. Stampede came over the line well ahead of Assassin with Redline taking third place from Cheeta. Debbie Too running in the middle of the field for the distance came home in fifth place with Chevvie and the ailing Vulture trailing the field. Draw for the final heat resulted in entrants being picked on the basis of their heat times. Aggressor took place one with Stampede, Wasp Two, Assassin, Redline, Jo Blo, Villain, Voodoo IV, Cheeta, Debbie Too, and History getting a start. Aggressor fuelled up once more at the start as Stampede leapt away. Wasp Two sat in close to the leader with Villain, Aggressor, Redline, Debbie Too, Jo Blo, Vulture standing in for sidelined Assassin, and Voodoo following. Clearing her lungs, Aggressor started her run. With Tenny concentrating on the wheel and Les Scott running lookout and adviser, the big boat closed the gap on the leaders. Running neck and neck for two laps the challenger always had the outside running and lost on the turns. A loose water hose stopped her run in lap five allowing Stampede to relax a little as Redline made her run. Wade in Redline had the advantage of surprise as he came within 50 feet of the big one. Saniga saw his danger and planted the foot in time to blast over the line at 120 or more mph followed less than 100 ft back by Redline. Wasp Two was third with Vulture, Villain, Cheeta and Jo Blo coming home in that order. Big upset of the day was the failure of the gregarious Kiwis to get a place. No one wanted them to win but there was plenty of goodwill for a place at least. The Victorian Speedboat Club’s running of the Griffith Cup was notable for various “firsts”. 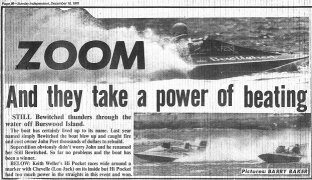 This was the first successful defence of the Cup by a Victorian boat, the first time that the two giant hydros had met, the first time that a team from the Shaky Isles had made the expensive trek to compete and the first time that a crowd of 16,000 had seen a speedboat meeting. It proved that a well run, properly promoted meeting can and will attract people to one of Australia’s most spectacular sports. the finish and successful Cup defence. She unofficially lapped at 98 mph at one stage. the boat to tackle Stampede in time. TOP ENTRIES: Stampede (defender), S. Jones and R. Saniga, Rolls Merlin 1600 ci, Vic. Vulture (runabout), John Lewis, 350 ci Chev, Vic. Jo Blo (runabout), Jack Bullen, 427 ci blown Chev, NSW. Black Knight (hydro), Pat Hawthorn, 361 ci blown Chrysler, Vic. Mystic Miss (hydro), Tom Watts, 327 ci Chev, Vic. Exciter II (hydro), Tom Watts, 441 ci blown Chrysler, Vic. Aggressor (hydro), Dave Tenny, 1600 ci blown Rolls Merlin, Vic. Yogi Bear (SK), Pearson Bros, 427 ci blown Chev, ACT. Voodoo IV (hydro), Bill Stokes, 307 ci Chev, NZ. Slipray (hydro), E. Baynton, 301 ci Chev, NZ. Air New Zealand (hydro), McGregor Bros, 364 ci Chev, NZ. Assassin (hydro), Trevor Matthews, 392 ci blown Chrysler, Vic. Villain (hydro), M. Langfard, 292 ci Chev, SA. Redline (hydro), P. Wade, 427 ci Chev, Vic. Wasp Two (hydre), D. Radburn, 330 ci Maserati, NSW. Cheeta (runabout), L. Ramsay, 299 ci Holden, Vic. Chevvy (runabout), L. Harris, 327 ci Chev, Vic. Debbie Too (skiff), G. Graham, 427 ci Ford, Vic. THE GRI FFITH CUP is the oldest perpetual trophy for motor sport in Australia. The hand beaten silver cup is by today’s standards an ostentatious piece of Victoriana but to power boatmen its value is far greater than the $3000 plus that it is reputed to be worth today. In 1910, E. C. Griffith created the Griffith Cup to encourage motor boat racing. Names such as the legendary Anthony Hordern, Rymill Bros, McEvoy, Len Southward, Jock Appleton, Arthur Baker, Em Nunn and Trevor Matthews are engraved upon it. Last year Bob Saniga and Stan Jones drove their mighty Stampede through the spray to take the trophy and this year for the first time they successfully defended it. 1964, Venus 1965, Mystic Miss 1966, Assassin 1967/68, Stampede 1970. 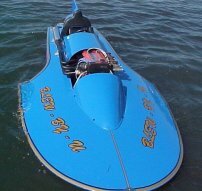 Owned jointly by Stan Jones and Bob Saniga, this 23 foot hydroplane was one of the first Australian race boats to successfully run a World War II ex-aircraft engine, in this case a massive V12. Rolls Royce Merlin engine from a Lancaster bomber. While Stan and Bob attend to the driving, aircraft engine genius. Clem Anderson looks after the fantastically complex 16 litre, 2000 h.p. power plant that has taken Stan Jones to 154.3 m.p.h. — an Australasian record. Co-winners of the 1970 and 1971 Griffith Cup, Stan and Bob will be trying hard to make this their third in a row. Both drive with skill and determination. Both are dyed-in-f he-wool hydroplane enthusiasts and together they make one of Australia’s greatest hydroplane driving teams. Ten years ago, a 20 year old youth commenced building Australia’s largest hydroplane. After almost a decade of problems and seemingly insurmountable obstacles. Dave Tenny finally has AGGRESSOR running fast and reliably. Best top speed to date is in the 130 m.p.h. range at just over half throttle. Until this season, a series of minor hull and engine problems have kept Dave from the winner’s circle. So far this season AGGRESSOR has had four wins in four starts and the 1972 Griffith Cup may be the fifth. During last year’s Griffith Cup, AGGRESSOR was moving up on STAMPEDE in the final heat when a fractured exhaust stub caused the engine water delivery hose to burst sending a geyser of water high in the air, halting Dave’s valiant attempt for the lead. Assisted in the cockpit by Les Scott and on the bank by his wife June, 1972 may well see AGGRESSOR’S name engraved on the Griffith Cup. Every powerboat racing enthusiast in Australia and New Zealand knows Ernie Nunn and WASP. Almost 70 years young (not old). 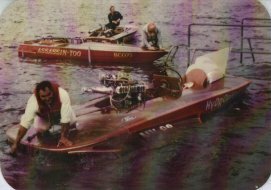 Ern holds the title of Australia’s Grandfather of speed boat racing. The recipient of much acclaim and many trophies and awards, he outclasses almost any other hydro driver, engine expert and hydroplane authority in country. His use of the best and most expensive European racing engines for hydroplane work is legendary. Ferrari engines have powered his last three boats — one of them regaining the Griffith Cup from New Zealand in 1962. The new 25 foot long WASP has a 51/2 litre V8. Maserati mounted beneath the cowling. Perfectly finished in every detail, even to the hand built aluminum trailer specially constructed for this new craft, Ern’s boat reflects the endless hours and full time devotion necessary to produce a griffith Cup winner. 1948. 1962, 1965 and 1968 were all WASP years, and in 1972 Ern will be trying for his fifth Griffith Cup win. 13 years ago Les Ramsay built and raced his first boat, a fibreglass runabout cal/ed SEE-VU powered by a 313 cubic inch V8. Chrysler engine. Between SEE- VU and Les’ present race boat CHEETA, there have been 12 craft, all manufactured from fibreglass, each one an improvement on the one before, all part of Les’ plan to develop fibreglass boats for competition use. From a small beginning in the Victorian town of Mansfield where Les ran a logging business and boats were manufactured only during the wet winter months, Ramsay Fibreglass Pty. Ltd. is now situated in a new factory in Vermont, from where high performance fibreglass boats fitted with a variety of engines and options are shipped to all states in Australia. The “Repco 5000” 300 c.i. racing engine now used to power CHEETA is a far cry from the earlier Chryslers and later the V8. Holden engines which Las was the first to use for marine racing. Developing over 450 b.h.p., the “5000” will spin reliably to nearly 9000 giving the lightweight hull enormous potential down the long Griffith Cup straightaways. MiId mannered Bendigo businessman Peter Wade is a JackIe and Hyde boat racer. Donning his crash helmet and life jacket transforms Peter into one of the nation’s top fire-breathing, snorting, hydroplane drivers. An active runabout driver for a number of years, Peter purchased the present REDL INE from Norm Quinn in late 1969. After adding 3 feet in length and dropping in a hot 427 c.i. Chev. Peter proceeded to round up the 1970 Griffith Cup field until the rough water and Pete’s ‘determined’ driving style demolished a sponson. An extremely fast, stable hydro and a perfect instrument with which Peter can display his driving skill and obvious love of ‘low level’ flying, REDLINE is now fitted with a fully imported supercharged 500 c.i. Chev. Some tuning problems have been experienced with this highly complicated rig, but if the engine develops anywhere near full power, REDLINE and Peter will be a formidable force in the big race. Owner and driver of Australia’s fastest unsupercharged displacement boat VULTURE, Boronia plumber, John Lewis has over the last three years amassed the incredible total of 8 Australian and 10 Victorian speed records, 3 championship wins and countless second placings behind large hydroplanes like STAMPEDE and AGGRESSOR. Undoubtedly, Victoria’s top displacement boat with an official top speed of 101.64 m.p.h. VULTURE started out in Dave Gill’s boat works as a fast ski-boat to be raced occasionally. Originally powered by a 300 ci. V8. Chev., the present fuel injected 350 c.i. motor was fitted two seasons ago. Since then the boat has seen a lot of racing and no skiing. Following a bad accident during a feature race after last year’s Griffith Cup and more recently being thrown against the cockpit and knocked unconscious at Albert Park Lake, John may not enter the 1972 Griffith Cup with VULTURE. He may decide to wait until his new Gilflite hydroplane is ready to run before competing in a race of this nature which favours a fast hydro. One of the best known teams in Australian Speed Boat racing; the Pearson Bros. and YOGI BEAR. Powered by a supercharged 427 c.i. Cheverolet engine, the red ‘S. K.’ has been seen at most major race meetings along the east coast. Hailing from Canberra where race water is non-existent, John and Bob must trailer YOGI BEAR a/most 200 miles for tuning and testing. Faced with many problems in their choice of a complicated but potentially powerful engine, the boys are about due to break through with a vengeance. Running very fast during the 1971 Griffith Cup, YOGI BEAR’S shaft loosened allowing the propeller to lock against the rudder. The speeding craft barrell-rolled across the water catapulting the Pearsons out. No damage, but very spectacular, If the water is smooth and all engine bugs are fixed, 1972 could be this team’s year. I have a long standing interest in this old stuff. I now own three old hydroplanes that have been painstakingly rebuilt over the years; all are race ready and compete whenever possible. My boats are WASP, KARRINA, and BLEW-BY-U. I was introduced to boat racing by my then father in law, Des Radburn, and in fact on the night I was to meet him (Des) for the first time I fell down the steps leading into his shed. Upon coming to my senses, the laughter of men was very clear and upon opening my eyes I was greeted by a crusty old fella. He grabbed my hand and pulled me to my feet before saying "...I hope you can drive better than you walk, boy..."
That crusty old fella was Ernie Nunn! How embarrassing! Anyway, now 30 years later, I reckon that I don't drive much better but at least I have Ern's boat. 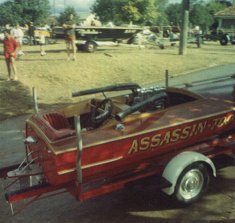 After an Auction in Seymour the Skiff was purchased by Trevor Mathews and fitted with a 265ci Chev to allow him more on-water time than he was getting with the Hydro Assassin. 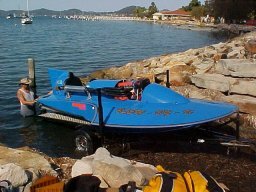 When Mathews moved out off Boat racing and into Aircraft the Skiff was purchased by the late ALAN HORE from the Glenmaggie Club and was raced with the 265 ci Chev. 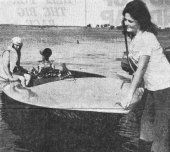 While on a trip to America Hore was diagnosed with serious illness and a few months later the Skiff was purchased by a person who cut out the deck and changed it to a Runabout configuration so they could use it as a Ski boat. I believe the boat was used in the Gippsland region after this the fuel injection I believe was sold off along with some other race pieces.